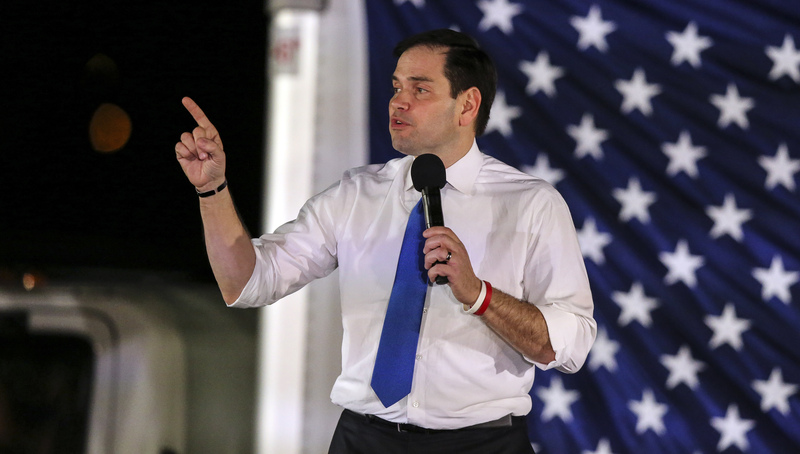 Marco Rubio's campaign is expanding its focus from a vote-Rubio to stop-Trump. On Friday, in an unusual moment in the nomination race, Rubio came about as close as a current presidential candidate could get to advocating for a different candidate. "I suspect that a voter in Ohio that doesn't want Donald Trump to win Ohio may very well conclude that the best way to stop him in Ohio is to vote for John Kasich," Rubio told reporters in West Palm Beach, Florida Friday. "And I respect that." Rubio has been working hard to win his home state of Florida Tuesday, where he's been narrowing front-runner Donald Trump's lead. In Ohio, however, which also votes Tuesday, there's no recent poll that shows Rubio above single digits, yet the survival of his own presidential candidacy depends heavily on Trump's failure to win either Florida or Ohio, two of the big winner-take-all states. "If a voter in Ohio is motivated by stopping Donald Trump and comes to the conclusion that John Kasich is the only one that can beat them there, then I expect that's the decision they'll make," Rubio reiterated. In Florida, however, Rubio made it clear he's the one who should be getting the votes. "The only one who has a chance to beat Donald Trump in Florida is me. Any vote that doesn't go to me is in essence helping Donald Trump to win the 99 delegates that this state will award to the winner," Rubio said. "If in Florida, Donald Trump wins by 1 vote, he will take 99 delegates and it makes it likelier he will be the nominee." A spokesman for the Ohio governor, Rob Nichols, agreed that Rubio backers should vote for Kasich: "They were going to do so anyway," he told CBS News' Erica Brown. But if Rubio's campaign was hoping for a little quid pro quo from Kasich, it was out of luck. When Trent Duffy, a spokesman for Kasich, was asked on CNN whether his campaign would tell Florida voters to vote for Rubio, he declined, saying that voters don't want to be told what to do. Kasich's campaign believes that the Ohio governor is the best man for the job in any state, Duffy added. The idea that Rubio supporters in Ohio should vote for Kasich tickled Ted Cruz. He laughed when asked about it in an interview with Sean Hannity and called it the Washington establishment's "last gasp." Florida and Ohio will both hold their winner-take-all primaries next Tuesday. According to recent polls of Florida, Rubio is closing in on Trump's lead, while in Ohio, Kasich trails Trump by single-digits.